Blanton Whitmire, whose contributions to the pest control industry include founding Whitmire Research Laboratories (a BASF legacy company) and developing the innovative “crack and crevice” aerosol technology, died on May 24. He was 97. A native of North Carolina, Blanton served the U.S. during World War II and upon returning home ventured east – to St. Louis, Mo. — where he joined his older brother Homer at Whitmire Research Laboratories. In the 1960s, Blanton developed the innovative “crack and crevice” aerosol technology which revolutionized the pest control industry worldwide. 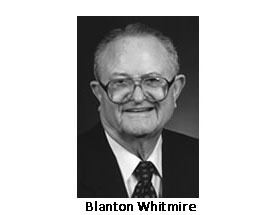 A huge proponent of education, Blanton created the highly acclaimed Whitmire Institute of Technology — an educational program for the industry. He also established the Blanton J. Whitmire Distinguished Professor of Structural Pest Management at North Carolina State University, an endowed position, which is currently held by Dr. Coby Schal. 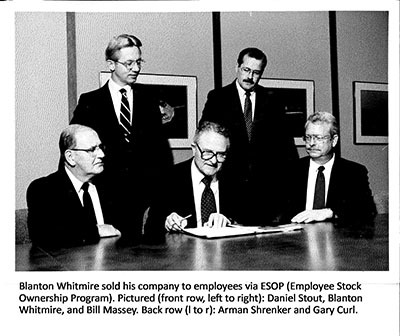 In 1987, he sold Whitmire Research Laboratories through an ESOP (Employee Stock Ownership Program). Whitmire Research Laboratories eventually merged with a number of other entities, becoming Whitmire Micro-Gen Research Laboratories. The entity was acquired by BASF in 2008. In retirement, Blanton and wife Peggy, who passed away in 2010, continued their charitable work, giving back to the community and sustaining a variety of educational, religious, and environmental causes. They established endowments at numerous institutions, including Western Carolina University, St. Louis Community College, and St. Louis’ Donald Danforth Plant Science Center, a nonprofit scientific facility dedicated to improving the human condition through plant science. The Whitmires received the Missouri Botanical Garden’s Greensfelder Award for their support in 2004. In 2005 Whitmire received an Honorary Doctorate of Humane Letters from Western Carolina University. A memorial service will be held Saturday, May 30, at 1 p.m. at First Presbyterian Church in Kirkwood, Mo.. In lieu of flowers, the family asks that you consider a donation to any of the nonprofits referred to above.